David Tennant, the 10th incarnation of Doctor Who, discarded the leather jacket of his predecessor Christopher Eccleston yesterday for a "geek chic" look that recalls some of his forerunners as filming began on a new series. The Scottish actor, most recently seen in period drama Casanova, was briefly glimpsed at the climax of the last series after Earth had been saved from thousands of flying Daleks. He appeared with the words: "Hello. New teeth. Now where were we?" Having brought the Daleks up to date, executive producer and writer Russell T Davies yesterday promised the return of the Cybermen in the new series. He said that other enemies would include "an evil race of Cat Women" and an episode in which the Doctor and his assistant Rose Tyler, played by Billie Piper, come face to face with Queen Victoria. Tennant has eschewed Eccleston's contemporary styling and the gentleman cricketer look sported by Peter Davison in the 1980s for a brown pinstripe suit, ankle-length brown coat and cream plimsolls. But his long flapping coat will remind many longstanding "Whovians" of the classic Doctors played by Tom Baker and Jon Pertwee in the 1970s. "I think we've come up with something distinctive that's both timeless and modern, with a bit of geek chic and of course, a dash of Time Lord," he said. "Most importantly, Billie tells me she likes it - after all, she's the one who has to see me in it for the next nine months. "We were delighted and honoured by the first series' success, and we can promise new thrills, new laughs, new heartbreak, and some terrifying new aliens," added Davies. Another face well known to long time fans of the series, the Doctor's former sidekick Sarah Jane Smith, will also return in the new series. The character, played by Elisabeth Sladen, appeared in the show between 1973 and 1976 as a companion to both Pertwee and Baker. Piper, who contrary to speculation will appear in the whole of the second series, said: "We plan to make series two even bigger and better and challenge the viewers' imaginations." The BBC's gamble in resurrecting Doctor Who with a big budget for a new generation has paid off with up to 10.5 million viewers, and TV executives claiming that it has restored the concept of mass family viewing to Saturday night schedules. APA 6th ed. : Gibson, Owen (2005-07-26). Timeless: A Doctor recalls. The Guardian p. 9. MLA 7th ed. : Gibson, Owen. "Timeless: A Doctor recalls." The Guardian [add city] 2005-07-26, 9. Print. Turabian: Gibson, Owen. "Timeless: A Doctor recalls." 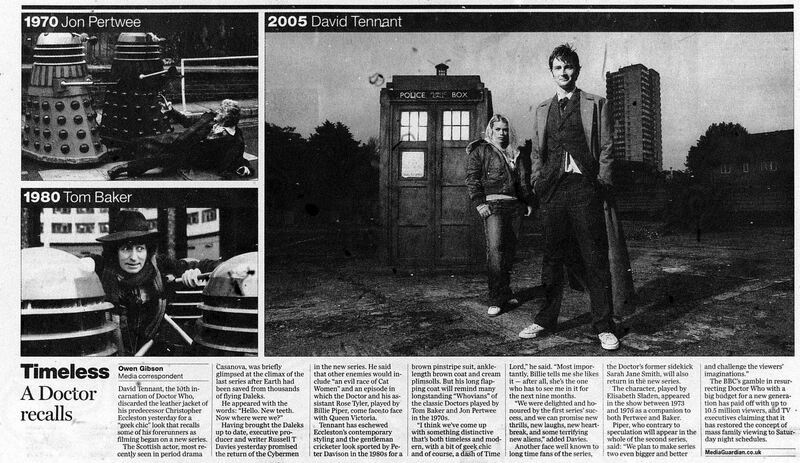 The Guardian, 2005-07-26, section, 9 edition. This page was last modified on 5 June 2015, at 02:13.